We are UK’s leading sweet bags wholesale supplier, supplying over 3500 clients inside London and loads of other clients around UK with quality sweet bags products. We supply all kind of sweet bags to a wide range of facilities including shops, hotels, restaurants, cafes and many other facilities. 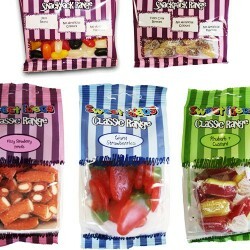 We have wide range of wholesale sweet bags products ready to be delivered to you. Extra Peppermint Gum (10 Pieces x 30) Product InformationExtra sugarfree gum .. Extra Spearmint Gum (10 Pieces x 30) Product InformationSugar free chewing gu..
Haribo Starmix - 12 x 140g Product DescriptionHaribo Starmix sweets. All your..
Maynards Wine Gums - 1 Case of 40 (52g Rolls) Product DescriptionDelicious fruit-fl..